Tommie Hoban scored a late winner for Blackburn at Nottingham Forest to boost Rovers' Championship survival hopes and leave Forest in relegation trouble. Rovers had the better first-half efforts as Connor Mahoney's free-kick and Hope Akpan's header went close. Forest's best move saw Armand Traore poke just wide but on-loan Hoban's header earned Rovers victory. Blackburn still sit in the final relegation spot, with Forest two points above them. Reds striker Britt Assombalonga was denied in the closing stages when goalkeeper David Raya, playing in his first Championship match in 20 months, spread himself to block inside the six-yard box. In a game of few other meaningful chances, the Lancashire side got three points when on-loan Watford defender Hoban headed in Mahoney's corner. Tony Mowbray's side were winless in seven league games but still face the prospect of dropping into the third tier for the first time since the 1979-80 season with four games to go. Forest have not won in their last six meetings with Blackburn and have just one victory in their past seven league matches. "We did not do enough to win the game today, it is as simple as that. We started brightly, for 10 minutes or so we looked very good. "I thought we were going to pick up from last weekend. But the simple fact is that we were sloppy and we gave the ball away cheaply. "We never really showed enough quality to deserve to take the three points. It was a scrappy game with very few chances for both teams." "I am not going to get too emotional because one result does not mean very much to us yet. Our target over Easter was to get six points from the two games. "We felt that we had to get that, following a bad weekend last weekend, when everyone else around us won. We knew this weekend would be a big, big test for us. "The first part of it we have managed to get through. But now we have another huge game to get through." Match ends, Nottingham Forest 0, Blackburn Rovers 1. Second Half ends, Nottingham Forest 0, Blackburn Rovers 1. Attempt blocked. Matthew Cash (Nottingham Forest) left footed shot from outside the box is blocked. Assisted by Eric Lichaj. Lucas João (Blackburn Rovers) is shown the yellow card. Lucas João (Blackburn Rovers) wins a free kick in the defensive half. Foul by Connor Mahoney (Blackburn Rovers). Attempt missed. Joe Worrall (Nottingham Forest) right footed shot from the centre of the box is high and wide to the right following a corner. Corner, Nottingham Forest. Conceded by Elliott Bennett. Attempt saved. Britt Assombalonga (Nottingham Forest) right footed shot from very close range is saved in the bottom right corner. Assisted by Eric Lichaj with a cross. Corner, Blackburn Rovers. Conceded by Michael Mancienne. Attempt missed. 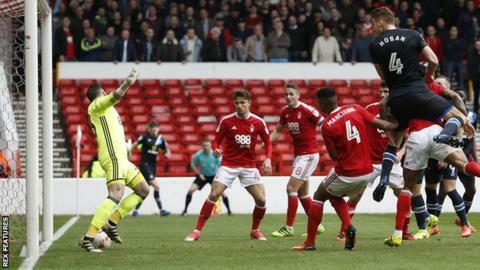 Joe Worrall (Nottingham Forest) header from the centre of the box misses to the right. Assisted by Ben Osborn with a cross following a set piece situation. Ben Brereton (Nottingham Forest) wins a free kick on the left wing. Goal! Nottingham Forest 0, Blackburn Rovers 1. Tommie Hoban (Blackburn Rovers) header from very close range to the centre of the goal. Assisted by Connor Mahoney with a cross following a corner. Corner, Blackburn Rovers. Conceded by Ben Brereton. Ben Osborn (Nottingham Forest) is shown the yellow card. Lucas João (Blackburn Rovers) wins a free kick on the left wing. Corner, Nottingham Forest. Conceded by Derrick Williams. Attempt missed. Zach Clough (Nottingham Forest) left footed shot from the left side of the box is high and wide to the left. Foul by Anthony Stokes (Blackburn Rovers). Substitution, Nottingham Forest. Britt Assombalonga replaces Jamie Ward. Substitution, Blackburn Rovers. Lucas João replaces Sam Gallagher. Attempt missed. Anthony Stokes (Blackburn Rovers) right footed shot from outside the box misses to the left. Derrick Williams (Blackburn Rovers) is shown the yellow card for a bad foul.